A potent and uplifting bath tonic that deeply cleanses, while also helping to tone, clarify and smooth the skin. Rich in minerals and vitamins, stimulating Laminaria Seaweed deeply cleanses while Mandarin and Orange Oils work to nourish and replenish for softer, smoother skin. Draw your bath, add two inner caps of the tonic and immerse yourself for 20 minutes. This tonic is highly stimulating so best used in the morning. Drink plenty of water afterwards to support the cleansing process. To intensify results, follow with Detoxifying Body Oil. Water (Aqua), Laminaria Digitata Powder, Sea Water (Maris Aqua), Benzyl Alcohol, Sodium Benzoate, Potassium Sorbate, Laminaria Digitata Extract, Sclerotium Gum, Xanthan Gum, Sodium Dehydroacetate, Citrus Aurantium Dulcis (Orange) Oil, Limonene, Citrus Aurantium Amara (Bitter Orange) Leaf/Twig Oil, Galactaric Acid, Linalool, Citrus Nobilis (Mandarin Orange) Oil, Cymbopogon Nardus (Citronella) Oil. A nice alternative to an algae wrap at home. Great for after a workout to replace some minerals and for the skin. Also makes your stomach flatter temporarily. The only downside is that it’s quite expensive. Over the years I have probably spent more money on beauty products than I care to admit but this is only my second review ever as I have never found many of the products purchased to exceed my expectation or equal the claims of the cleverly drafted scribe of the author marketeer. However, I have used this product for 3 years and find it to match its claims. No, it’s not a product of gorgeous Spa smells or consistency but, it’s certainly aids my “Detox” days. THE REASON FOR THIS REVIEW HOWEVER, IS NOT FOR THIS BATH SOAK BUT, FOR THE TWO SAMPLES THAT ACCOMPANIED IT. Overnight Hydration Therapy is just a miracle cure for my dry and sensitive skin and Skin Rescue Balm knock its “8 Hour” luxury competitor “Out of the Park” as my normally dry skinned winter feet are are so soft and supple ... just amazing. 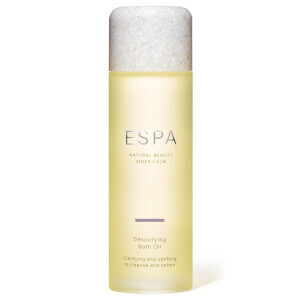 Two glorious top drawer products to add to my ESPA wish list which are certainly worthy of the time spent writing this 5 star review. Very good service. I would like to know if your products are tested on animals. The product is not overly scented and creates a relaxing and restoring bath, the bottle is lovely too. Looks awful in the bath. Not sure if it does any good.